Why are you more expensive than the other guy? Is my sewer line broken? What can I do to never have to call you guys again? What can you do about roots in my main sewer line? How long does a sewer replacement take? How long will I be without the use of water in my house? Are there any sewers that can't be lined? Our prices are set based on what machine is required for the job. Different drains require different equipment, thus requiring various amounts of time and skill to use. Unlike other companies, we are not just trying to get our foot in the door to sell you a much more expensive service once we get there. We will never sell you something you don't need. We will discuss all options with you, so you can make an informed decision that fits your personal situation. We offer unparalleled customer service, we use the best machines in the business, and we offer our honest diagnosis of your sewer or drain problem. Our drain cleaning typically lasts two to three times longer than someone who simple pokes a hole in the blockage to get the drain working for a short period of time. We actually clean the drain the correct way so it lasts and saves you from having more frequent backups. The only way to know if your sewer line is broken, is to run an in-line camera. It's often that heavy roots or other obstructions can give the illusion that the line is broken, but it's really not. On many occasions, we're able to resolve the issue by properly cleaning the line, which puts off the need to replace your sewer line. A lot of Clog-Busters customers participate in a yearly maintenance program. This service can prolong the life of your sewer and drain system, which helps eliminate emergency services or repairs. There are a number of things you can do to avoid sewer backups. When using your bathroom facilities only flush urine, feces and toilet paper. It's not recommended to flush feminine products, flushable wipes or paper towels. When it comes to kitchen drains, we recommend scraping you plates into the garbage, instead of the garbage disposal. We also recommend draining your kitchen grease in a can / jar and disposing of it. This helps eliminate pouring grease down your line, which will often leads to issues. We offer a couple of solutions for roots in your main sewer line. Because roots are often the cause of sewer backups, Clog-Busters has developed a maintenance program for its customers. This program is set up individually for each customer depending on their roots and helps alleviate any extra stress. If you don't want to maintain your roots, you also have the option of replacing or repairing the section where the roots are entering the pipe. Yes, Clog-Busters is fully licensed and insured. We've been in business serving customers for over 20 years. We can typically finish most sewer repairs and replacements in one day. Basement floor breaks typically take two days. We will discuss a timeline in detail with you when we come out for a free, no obligation estimate. How long will the new sewer or drain liner last? If you decide to replace your sewer line with Schedule 40 PVC pipe, it will last longer than you are in the house. You will never need to worry about a broken sewer line again if you replace it. Other solutions will also last upwards of 50 years. There is only a short period of time when you will actually not be able to use water. We will let you know when this is when we come out for the repair, and can plan it around your schedule to minimize the inconvenience. We can line clay crock, cast iron, PVC and even Orangeburg. If the sewer line has collapsed or if there is a 90 degree turn in the sewer line, we will have to discuss other solutions. We have been serving all of southern and southeastern Michigan for over 20 years. 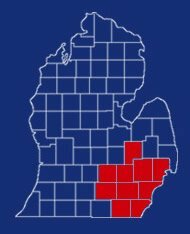 We have customers in Adrian, Albion, Allen Park, Ann Arbor, Auburn Hills, Belleville, Berkley, Beverly Hills, Birmingham, Bloomfield Hills, Bloomfield Township, Brighton, Brooklyn, Brownstown, Canton, Chelsea, Clarkston, Clinton Township, Commerce Township, Davisburg, Dearborn, Dearborn Heights, Dexter, Farmington, Farmington Hills, Fenton, Ferndale, Flat Rock, Franklin, Gibraltar, Green Oak Township, Grass Lake, Gregory, Grosse Ile, Grosse Pointe, Grosse Pointe Farms, Grosse Pointe Shores, Grosse Pointe Woods, Hamburg, Hamtramck, Hartland, Harper Woods, Highland, Howell, Huntington Woods, Huron, Jackson, Keego Harbor, Lathrup Village, Lake Angelus, Lansing, Lincoln Park, Livonia, Lyon Township, Melvindale, Milford, Monroe, New Boston, New Hudson, Northville, Novi, Oak Park, Orchard Lake, Pinkney, Pleasant Ridge, Plymouth, Redford, Rochester, Rochester Hills, Romulus, Roseville, Royal Oak, Shelby Township, Southgate, Southfield, South Lyon, St. Claire Shores, Sterling Heights, Stockbridge, Taylor, Tecumseh, Trenton, Troy, Utica, Walled Lake, Waterford, West Bloomfield, Westland, White Lake, Whitmore Lake, Wixom, Woodhaven, Wolverine Lake, Wyandotte and Ypsilanti.